bird on the wire: "Straight No Chaser: Live in New York" tonight (and live in Prov on 11/16)! "Straight No Chaser: Live in New York" tonight (and live in Prov on 11/16)! If the phrase "male a cappella group" conjures up an image of students in blue blazers, ties, and khakis singing traditional college songs on ivied campuses, then think again. 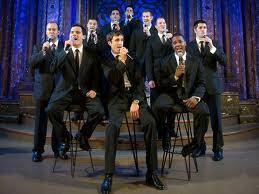 Straight No Chaser (SNC) are neither strait-laced nor straight-faced, but neither are they vaudeville-style kitsch. As original member Randy Stine comments, "We take the music very seriously; we just don't take ourselves too seriously." In the process, they are reinventing the idea of a cappella on the modern pop landscape. Don't miss Straight No Chaser tonight at 8:30 p.m. on WSBE in advance of their stop in Providence on November 16 during their Fall 2011 Tour. The a cappella group promises bigger and better this year. They will have brand-new songs, a brand-new stage, and the biggest production they have ever carried around. But of course, you can still expect the same ten fun-loving Straight No Chaser guys in suits. WSBE has your tickets for the upcoming Straight No Chaser concert on November 16 at the Dunkin' Donuts Center in Providence.